The Pound-to-Euro exchange rate is expected to recover during the second half of 2017 and into 2018 say experts at an independent economic analysis and forecasting institute but banking heavy-weights HSBC still see EUR/GBP falling to 1.00. "We don’t share other forecasters’ pessimism about the prospects for economic growth," says Jonathan Loynes, of advisory service Capital Economics. In a note dated September 7, Capital Economics say they see UK economic growth rising to 2.2% in 2018, which is much higher than the consensus market expectation of only 1.2%. The latest available data on the economy shows annualised growth standing at 1.7%. If their forecasts are true, "then there is clearly scope for a growth-supported rise in Sterling," says Loynes who believes the Bank of England might be obliged to act and raise interest rates in response to an economy performing at decent levels. The relative optimism adopted by Capital Economics is based on expectations that the economy will be more resilient than most forecasters expect and comes at a time when the Pound remains close to the eight-year lows it tested against the Euro in late August. Thus far in 2017 the Pound has lost 7% in value against the Euro. But a rise in net trade is tipped to help offset a fall in consumer spending as demand for expensive foreign imports falls, whilst UK exports continue to outperform helped by a weak Sterling. "We expect growth to regain momentum in the second half of the year as stronger net trade and investment growth help to offset the ongoing slowdown in consumer spending growth," says Loynes. The market is also accused of being too pessimistic about interest rate rises at the Bank of England which Loynes sees rising earlier than currently anticipated. "Investors are currently pricing in a first hike in 2019. And the big picture remains that they doubt that the Bank will be able to raise rates much at all, with only two 25bp hikes expected in the next four years," said Capital's Loynes. Indeed, we reported yesterday that analysts at UBS suggest the Bank might cut rates again and add further to their quantitative easing programme. Yet, despite the recent slowdown in growth, the economy remains resilient after the referendum. The labour market it tight by historical standards too. "The labour market is very tight by historical standards. Given this, the current extraordinarily loose stance of monetary policy is unlikely to be needed for much longer." A major driver for the Pound is the Bank of England (BOE) official interest rate, which pushes up its value when the BOE raise it. Capital Economics envisage a first interest rate hike by the BOE as early as May 2018, again much earlier than most economists currently expect. "The tight labour market is likely to add some impetus to wage growth which would shift the balance on the Committee towards the hawks. We have pencilled in a first 25bp hike in May 2018, followed by another 25bps each six months after that." A more gradual tightening schedule should keep households’ debt servicing costs "manageable," said Capital, "allowing the tightening to be sustained." The one possible fly in the ointment is the Composite PMI, which suggests bank rate should remain unchanged. "Admittedly, on the basis of past form, the composite PMI points to Bank Rate remaining unchanged. And the hard data have been weaker than the survey has suggested in recent quarters," says Loynes. But this does not change Capital's forecast, who remain optimistic about growth. In regards to the the Pound-to-Euro rate more specifically, there may also be a limit to how much higher the Euro can rise on improving sentiment. "At the same time, there is a limit to the extent that improving sentiment towards the euro-zone’s economic recovery can continue to provide a fillip to the single currency. What’s more, we think that investors are underestimating the amount of monetary tightening that will be required by the UK MPC over the coming years," said Loynes. Capital Economics forecast the Pound-to-Euro exchange rate to rise to 1.10 by the end of 2017 ahead of a further rise to 1.17 by end-2018. The robust form shown against the Euro is forecast to extend to the Pound-to-Dollar exchange rate. Capital forecast the conversion to be at 1.30 by year-end, 1.33 by mid-2018 and 1.35 by end-2018. Get up to 5% more foreign exchange by using a specialist provider by getting closer to the real market rate and avoid the gaping spreads charged by your bank for international payments. Learn more here. We can also report today that HSBC Global Research have maintained their forecast for the Pound and Euro to equalise in value. HSBC have been one of the most bearish institutions on the exchange rate for some time now and the bank's latest quarterly currency forecasts confirm there is no reason to shift stance. further to keep attracting capital inflows. "We do not dispute that GBP is ‘cheap’ relative to fair value, but as a tool of economic adjustment, it has to get cheaper. We look for GBP-USD to hit 1.20 by year-end 2017, and EUR-GBP to reach parity." The call by HSBC comes on the same day as the ONS releases the UK's latest trade data that shows the UK's trade balance remains woefully in deficit to the tune of 11.58BN in July. Exports are not picking up while the country's addiction to imports appears to be withstanding the decline in Sterling. It has been a busy end to the week for UK corporates which are reporting. And it would appear that domestic-facing companies are reflecting a slowing in the UK’s economic picture. A profits warning from Safestyle sent the share price plunging and could point to a gloomy second half for parts of the UK economy. The stock collapsed 40% after a second profits warning in as many months. It was only in July that the firm first warned on deteriorating trading. Now again it warns that anticipated profit for the year will be lower than previously expected. Order intake has declined more than it thought in July, which it blames on ‘accelerating weakness’ in the market due to greater consumer caution. Industry statistics show an 18% decline in installations in June and July compared to 2016. “Does this suggest a slowdown in home improvements as Brits pare back their spending? Credit growth has slowed, with the latest Bank of England figures showing total borrowing on cards, loans and car finance grew at less than 10% in July,” notes Neil Wilson at ETX Capital. Most consumers tend to require some kind of finance to install new windows so this decline has clearly impacted Safestyle notes Wilson. The analyst suggests it could also start to have a greater effect on others in the sector, eg Kingfisher, SIG and Howden Joinery. “The UK economy has slipped to the bottom of the EU ranks this year and with consumer spending and credit appearing to slow, the outlook isn’t a lot better,” says Wilson. Driving home this theme, Greene King results also signal weakness in consumer spending and confidence. The pub industry registered a 0.7% fall. Wetherspoons shares are down nearly 3% in early trading. June was hot and dry but since the second half of July the wet weather has kept boozers away from pub gardens. .
“Expect a return to year-on-year growth this time next year when the World Cup comes into play. But it’s yet another sign that the squeeze on consumer spending is hitting company profits,” says Wilson. 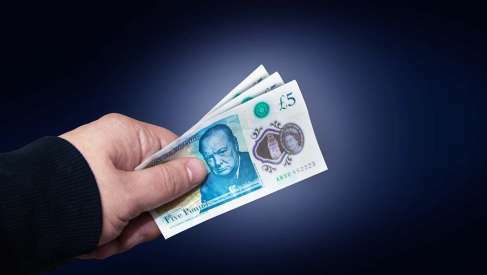 The British Pound is flat at the start of the new week but political intrigue in Westminister is expected to start building as MPs return from their Easter break.